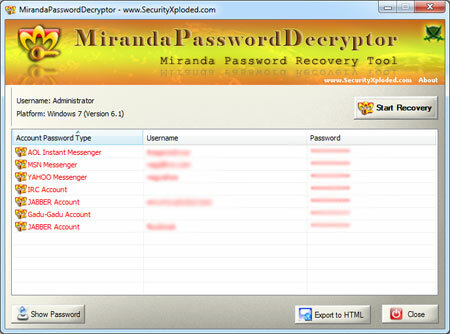 MirandaPasswordDecryptor is the FREE software to instantly recover passwords stored by Miranda. Miranda is open source based Messenger which has become more popular in the recent times. It's simple interface makes it very easier and faster. It is universal messenger which supports multiple IM protocols including Yahoo, MSN, GTalk, Jabber, Facebook IRC, AIM, Gadu-Gadu etc.Easier and faster to use with its enhanced user friendly interface. The FREE software to instantly recover account passwords stored by Miranda. ...... It uses its own proprietary format to securely store the account passwords from prying eyes. Miranda Password Decryptor helps in automatically recovering all such passwords for all protocols. Miranda Password Decryptor can automatically detect correct password location based on installed version of Miranda and recover the passwords instantly using the right decryption method. Here are the highlights of top features of Miranda Password Decryptor which makes it stand apart from other similar tools including commercial ones. # Instantly decrypt and recover stored encrypted passwords by Miranda for all protocols. # Recovers passwords of any length and any complexity instantly. # Displays messenger type, username and password for all recovered accounts. # Sort option to arrange the displayed password list by username and password which makes it easy to search through 100's of entries. Qweas is providing links to Miranda Password Decryptor 1.2 as a courtesy, and makes no representations regarding Miranda Password Decryptor or any other applications or any information related thereto. Any questions, complaints or claims regarding this application Miranda Password Decryptor 1.2 must be directed to the appropriate software vendor. You may click the publisher link of Miranda Password Decryptor on the top of this page to get more details about the vendor.